Travelers looking for a back-road route to the Charles Schulz airport from downtown Santa Rosa will likely find themselves on Laughlin Road, a beautiful narrow drive through sparsely populated neighborhoods blending homes and agriculture. Close to the airport destination, Laughlin Road becomes very narrow and includes three 90-degree turns and a one-lane bridge. And that’s where the trouble begins. When an oversized vehicle attempts to navigate this portion of Laughlin, the charming drive evolves into a thorny challenge that leads to tow trucks, winches, and a complete street closure in order to help jimmy out trucks and vehicles that can’t navigate the hard turn onto the narrow bridge. Unsticking those vehicles became the recurring (and expensive) responsibility of Johannes Hoevertsz, Sonoma County’s Director of Transportation and Public Works (TPW). Enter the arts. 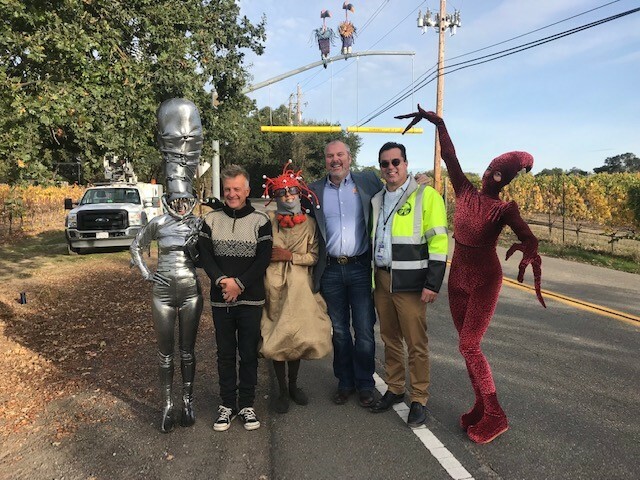 In a serendipitous series of events, including an assist from Supervisor James Gore, Creative Sonoma and TPW came together to talk about incorporating art into public works projects at exactly the right moment. Puzzling through ideas about how to draw heightened attention to the size limitation for safe passage of the Laughlin Bridge, given that truck drivers had been ignoring standard signage for years, the concept of using art to help solve this challenge was ripe for exploration. Hoevertsz had an artist in mind who could create a sculpture that would provide the perfect mix of warning and whimsy. Creative Sonoma forged the introduction to Patrick Amiot, Sebastopol resident and artist known for his remarkable found object sculptures lining both sides of Florence Street, as well as many other public and private locations through Sebastopol and the County. At first, Amiot was skeptical of getting involved in a public project. His comfort zone did not include engineering and bureaucracy. But with assurances from Hoevertsz that Amiot would be free to explore his creative vision with TPW managing the rest, Amiot came on board. Amiot’s creative team is a family affair, with wife Brigitte Laurent working as the painter of the projects and daughter Mathilde as the welder. And on Halloween, 2018, the new project was unveiled. In addition to thanking Amiot and his family, Hoevertsz congratulated the TPW team that constructed the frame and installed the vulture sculptures, and remarked that, along with the artistic element, it was an incredibly cost-effective endeavor as well: the materials were all sourced from recycled and remnant materials in the County’s Santa Rosa Corp Yard. On hand at the launch was local resident, “Buzz,” who has become the de facto defender of the bridge for the neighborhood. He expressed great appreciation – and expectations – for the sculpture, not least because his nickname evokes the buzzard-like images that are designed to stare down any drivers foolish enough to still try to make the turn. A second installment will coming soon to guard the opposite entrance to the bridge. October 31 (partially costumed!) unveiling, l to r: Mathilde Amiot, Patrick Amiot, Brigitte Laurent, Supervisor James Gore, Johannes Hoevertsz, Ursule Amiot.